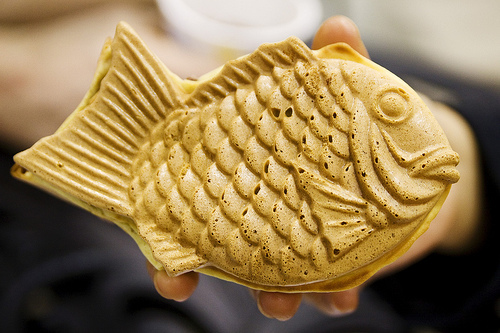 The classic Japanese winter sweet, Taiyaki. 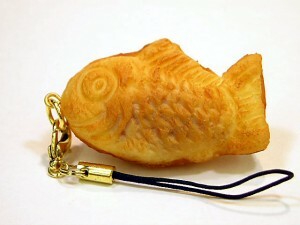 It’s a fish shaped cake made from waffle batter and has filling inside, usually sweet red bean paste. 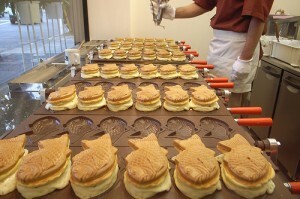 In these few years, Taiyaki business seem to be booming. 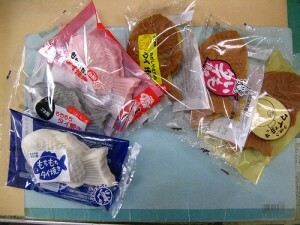 Different Taiyaki shops make different fillings and batter to brand themselves. There are all kinds of Taiyaki such as chocolate, custard, green tea and sausage but especially the white chewy Taiyaki is popular now. Why Taiyaki is HOT now? The taste counts of course, but the economical depression is another reason. Opening for Taiyaki business is easier than other food businesses because it needs only a few fund and making Taiyaki is easy; therefore, while a lot of businesses shut down, Taiyaki shops are increasing now. If you ever come to Japan, please try Taiyaki.